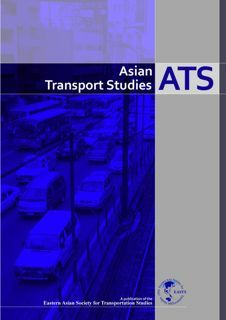 ATS is a unique academic journal that highlights “transport in Asia.” ATS aims at providing useful insights into solving Asia-specific transport-related issues from both theoretical and practical perspectives. It treats all types of transport modes and all issues in the transport sector. Even though papers dealing with the Asia-specific issues are especially welcome, other papers related to transportation studies are also within the scope of this journal; papers from non-EASTS members and from non-Asian transportation professionals are also welcome. EASTS, which was founded in 1994, is an international cooperative society of researchers and practitioners from the Asian region. Its primary objectives are to foster and support excellence in transportation research and practice and to stimulate professional interchanges in all aspects and modes of transportation. It organizes an international conference on transportation research every two years, in which many transportation professionals, including policy makers, administrators, practitioners, researchers, and representatives of government, industry, and academic institutions participate. ATS papers are published through a rigid peer-review process. They include the papers recommended from the EASTS conference and general (non-conference) papers from transportation professionals. Note that the recommended conference papers should be reviewed in the same way as the general papers. The general papers can be submitted to the ATS editor at any time. The acceptance rate of the papers recommended from the EASTS Conference was 6.70% in 2017. Publication cycle: ATS is published biannually. One volume consists of four issues, in which two issues are published every year. Issues 1 and 2 are published in March and September of the first year, respectively, which include both the papers recommended from the EASTS conference and the general papers. Issues 3 and 4 are published in March and September of the second year, respectively, which include the general papers only. Ethics: ATS follows the COPE (Committee on Publication Ethics) guidelines on how to deal with potential acts of misconduct. We handle the cases requiring corrections, retractions, and editorial expressions of concern by COPE guidelines (detail).